We are used to seeing cats climb up trees like if it’s no big deal, but seeing a dog climb up a tree may seem quite close to impossible. 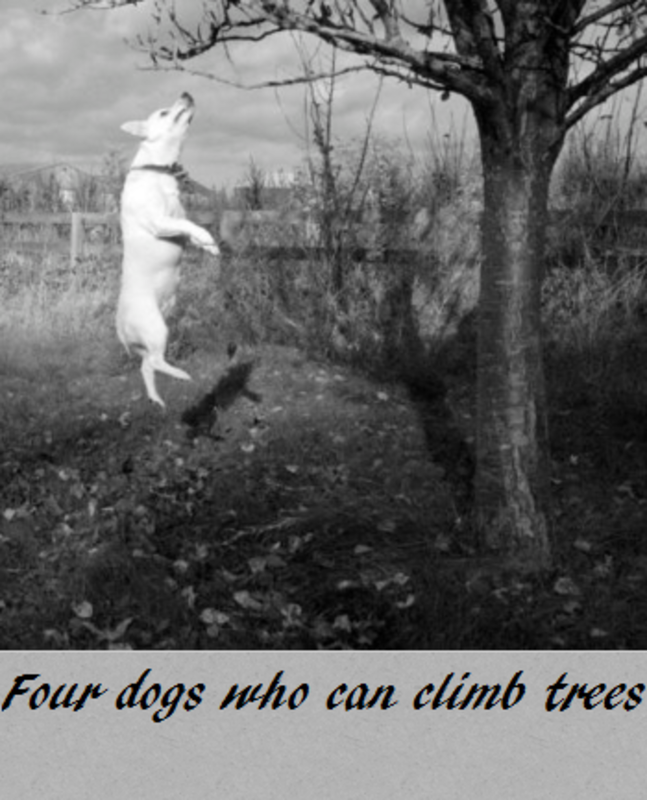 Yet, there are several dog owners who can attest that they own talented dogs who can effectively climb up a tree; indeed, some dogs can climb up trees so well, they have even managed to escape the yard if the tree happened to be strategically close to a fence! 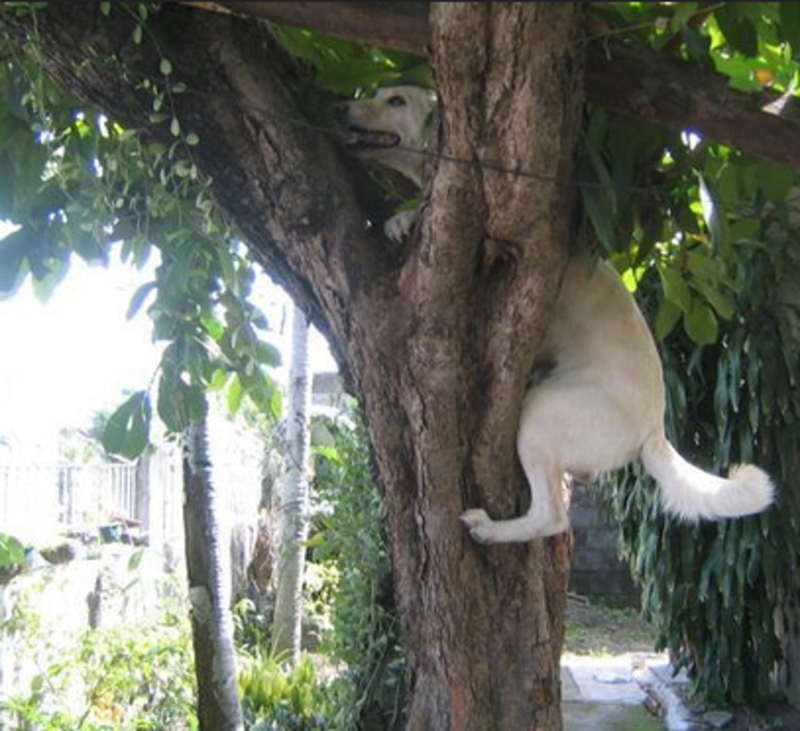 How can dogs though manage to climb up a tree? We know that their conformation isn’t very suitable for the task, but apparently for some dogs, when there is a will there is way! Is it a dog or a cat? If cats have amazing tree climbing abilities, they must thank their sharp, retractable claws with curved angles. Cats use their claws like miniature mountaineering crampons (likely these were inspired from them!) which makes them perfect for climbing up. Those same claws though are unfortunately not well designed for climbing down though, which is why cats tend to get stuck in trees– but this is a whole different story! On top of having sharp claws, cats also have agile bodies with very mobile shoulders and hip joints which facilitate them in being proficient climbers. Most likely cats have evolved to climb trees because of their preference for living in wooded environments. Dogs on the other hand, seem to have lived for the most part in open plains, so their body is built for this environment, suggest Xiaoming Wang, Richard H. Tedford, Mauricio Antón, in the book “Dogs: Their Fossil Relatives and Evolutionary History.” The do not have retractable claws, nor are their bodies built for being proficient climbers as the cat. Their ancestors were social hunters with bodies built more for long-distance endurance running on open fields rather than short, bursts of speed. In the dog world, it looks like you can never make any black and white statements. After discovering how the bodies of cats are built to help them climb and how a dog’s body differs from it, you would assume dogs have no good reason for hanging around trees. This very rare breed is for the most part a wild dog that has originated from the island of New Guinea; however some of these captive bred dogs are nowadays also being kept as companions. These dogs are called singing dogs for a good reason: they emit unique yet, melodious vocalizations. These dogs are relatively short-legged with very flexible limbs and spine which makes them quite agile. It is thanks to this flexibility that they are able to spread their legs sideways in a similar fashion to the Norwegian Lundehund. On top of that, these dogs can rotate their front and rear legs which allows them to climb trees to search for prey! See video below to watch these amazing dogs in action climbing up trees and singing their delightful melodies! As the name implies, the Louisiana Catahoula leopard originated in North Central Louisiana nearby the Catahoula Lake. This dog breed with a striking coat has a history of tracking and herding wild hogs that roamed the forests. Catahoulas are known for being well muscled, powerful dogs, that give the impression of agility and endurance. And they sure are quite agile! They may be not as flexible as the New Guineas singing dogs, but there are several owners attesting that their Catahoula dogs are capable of climbing up trees! As the name implies, this dog breed is one of those who were selectively bred to hunt raccoon, tracking them down and treeing them. Raccoon weren’t the only animals these dogs hunted though, they sometimes also would hunt down and tree bobcats, cougars and even the occasional bear. While the main job of these dogs is to bay with their distinctive howl to inform the hunter that they have treed their prey, some of these guys (and some other coonhounds) take their career at a higher level and manage to virtually climb up the tree! For those not familiar with these little feisty dogs, these innocent looking pooches are often labeled as big dogs in little bodies. The saying “when there is a will there is a way” fits these fearless dynamite dogs perfectly. A securely fenced yard is not an option with these fellows, it’s an obligation, as these astute dogs have quite a Houdini reputation. If they can’t jump over the fence, they’ll try to dig under and some owners have reported these little fellow can even climb their way out by using tree limbs as helpful perches to get from point A to point B! Definitively not worth the stunt, as much as it may impressive. 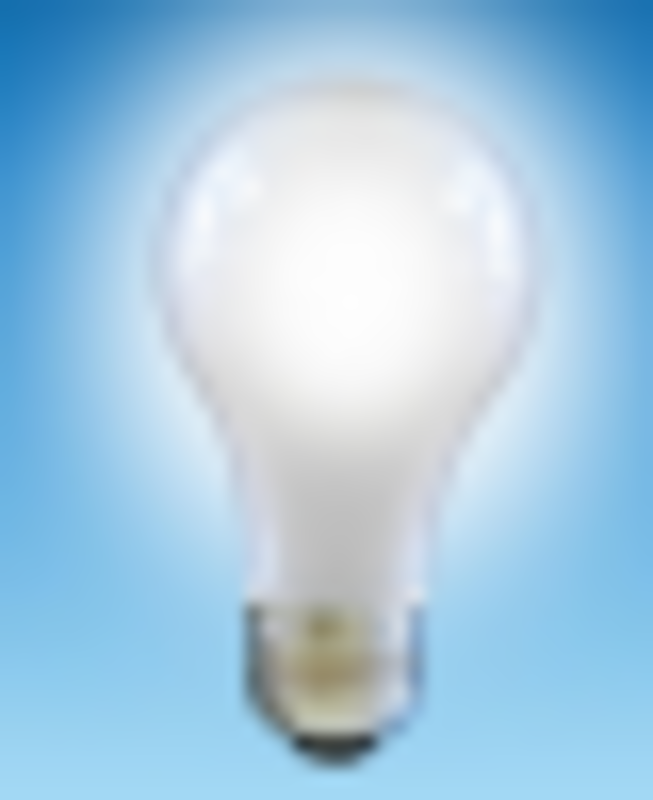 For sure though, this is an eye opener, meaning that tree climbing is another of those things dog owners may want to watch for when leaving their dogs unattended in the yard. “When there is a will there is way” and some agile dog may manage to climb up a tree, whether they’re chasing a squirrel up a tree or planning to evade the yard. Do Dogs Have a Collarbone?